Pictured: The two suspects arrested on charges of possession and dealing in illicit drugs in Walvis Bay and a law enforcement official holding the bag of dagga (circled in red) confiscated from the men. 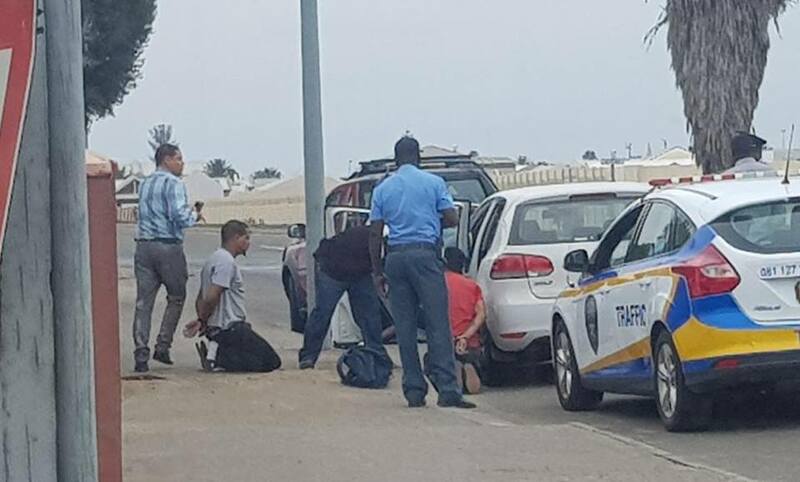 Residents of the Hermes neighbourhood of Walvis Bay looked on in surprise as police assisted by municipal traffic officials swooped in on a drug dealer in their midst. 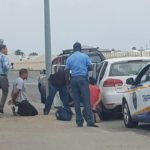 The suspect, the 28-year-old Lee-Roy Murphy, was sitting in his car in Hidipo Hamutenya Street next to the school yard of the Duneside High School when members of the police approached to affect the arrest. According to the Erongo Regional Crime Investigations Coordinator, Deputy Commissioner Erastus Iikuyu, the arrest was the result of a special operation by members of the drug law enforcement division. The second suspect was identified as the 27-year-old Jean Pierre Joseph. Both the suspects are scheduled to make their first appearance in the Walvis Bay Magistrate’s Court on Friday morning. Murphy was charged with possession and dealing in illicit drugs while Joseph will only face a charge of possession. A third man was taken into custody but after questioning by police officers, he was set free. According to Deputy Commissioner Iikuyu the value of the drugs confiscated from the two suspects is estimated to be about N$3 870.